European territory inhabited by West Slavs and East Slavs circa 700-850 AD. White Croats (Croatian: Bijeli Hrvati; Polish: Biali Chorwaci; Czech: Bílí Chorvati; Ukrainian: Білі хорвати, translit. Bili khorvaty) were a group of Slavic tribes who lived among other West and East Slavic tribes in the area of Bohemia, Lesser Poland, Galicia (north of Carpathian Mountains) and modern-day Western Ukraine. They were documented primarily by foreign medieval authors and managed to preserve their ethnic name until the early 20th century, primarily in Lesser Poland. It is considered that they were assimilated into Czech, Polish and Ukrainian ethnos, and are one of the predecessors of the Rusyn people. In the 7th century, some White Croats migrated from their homeland White Croatia to the territory of modern-day Croatia, forming the ancestors of the South Slavic ethnic group of Croats. It is generally believed that the Croatian ethnonym - Hrvat/Horvat/Harvat - etymologically is not of Slavic origin, but a borrowing from Iranian languages. It is considered that the ethnonym Hrvat is first attested on the two Tanais Tablets, found in the Greek colony of Tanais in the late 2nd and early 3rd century AD, at the time when the colony was surrounded by Iranian-speaking Sarmatians. The first Iranian tribes who lived on the shores of the Sea of Azov were Scythians, who arrived there c. 7th century BCE. Around the 6th century BCE the Sarmatians began their migration westwards, gradually subordinating the Scythians by the 2nd-century BCE. During this period there was substantial cultural and linguistic contact between the Early Slavs and Iranians, and in this environment were formed Antes. Antes were Slavic people who lived in that area and to the West between Dniester and Dnieper from the 4th until the 7th century. It is thought that White Croats were part of the Antes tribal polity who migrated to Galicia in the 3rd-4th century, under pressure by invading Huns and Goths. They lived there until the Antes were attacked by the Pannonian Avars in 560, and the polity was finally destroyed in 602 by the same Avars. This resulted with breaking Croatian tribal unity into several groups, in Prykarpattia (Western Ukraine), in Silesia and the lower course of the Vistula river (Lesser Poland), and Eastern Czech Republic. The early Croats' migration to Dalmatia (during the reign of Heraclius 610-641) can thus be seen as a continuation of the previous war between the Antes and Avars. The epithet "white" for the Croats and their homeland is related to the use of colors for cardinal directions among Eurasian people. That is, it meant "Western Croats", in comparison to lands where they lived before. The epithet "great" signified an "old, ancient" or "former" homeland, for the Croats when they were new arrivals in the Roman province of Dalmatia. There is a dispute among Slavic scholars as to whether the White Croats were of Irano-Alanic, West Slavic, or East Slavic origin. Some scholars linguistically and archaeologically draw parallels between White Croats and Slavs, and the Carpi, who previously lived in the territory of Carpathian Mountains. Whether the early Croats were Slavs who had taken a name of Iranian origin, or whether they were ruled by a Sarmatian elite and/or were slavicized Sarmatians, cannot be resolved. The possibility of Irano-Sarmatian elements among, or influences upon, early Croatian ethnogenesis cannot be entirely excluded. Ptolemaic map of Scythia 1598; the Horinei are mentioned below Amazons. Any mention of the Croats before the 9th century is uncertain, and there were several loose attempts at tracing; Struhates and Auhates by Herodotus, Chatti and Chattuarii by Strabo, Choatræ and Arivates by Pliny the Elder, Horites by Orosius in 418 AD, and the Harus (original form Hrws, some read Hrwts; Hros, Hrus) at the Sea of Azov, near mythical Amazons, mentioned by Zacharias Rhetor in 550 AD. The Hros some relate to the ethnonym of the Rus' people. Nestor the Chronicler in his Primary Chronicle (12th century) mentions the White Croats, calling them Horvate Belii or Hrovate Belii, the name depending upon which manuscript of his is referred to: "Over a long period the Slavs settled beside the Danube, where the Hungarian and Bulgarian lands now lie. From among these Slavs, parties scattered throughout the country and were known by appropriate names, according to the places where they settled. Thus some came and settled by the river Morava, and were named Moravians, while others were called Czechs. Among these same Slavs are included the White Croats, the Serbs, and the Carinthians. For when the Vlakhs (Romans) attacked the Danubian Slavs, settled among them, and did them violence, the latter came and made their homes by the Vistula, and were then called Lyakhs (Lendians or Lechites). Of these same Lyakhs some were called Polyanians, some Lutichians, some Mazovians, and still others Pomorians". "The Croats at that time were dwelling beyond Bagibareia (usually considered to be Bavaria), where the Belocroats are now. From them split off a family, namely of five brothers, Kloukas and Lobelos and Kosentzis and Mouchlo and Chrobatos, and two sisters, Touga and Bouga, who came with their folk to Dalmatia and found this land under the rule of the Avars. After they had fought one another for some years, the Croats prevailed and killed some of the Avars and the remainder they compelled to be subject to them... The rest of the Croats stayed over near Francia, and are now called the Belocroats, that is, the White Croats, and have their own archon; they are subject to Otto, the great king of Francia, which is also Saxony, and are unbaptized, and intermarry and are friendly with the Turks. From the Croats who came to Dalmatia, a part split off and took rule of Illyricum and Pannonia. They too had an independent archon, who would maintain friendly contact, though through envoys only, with the archon of Croatia... From that time they remained independent and autonomous, and they requested holy baptism from Rome, and bishops were sent and baptized them in the time of their Archon Porinos". "These same Croats arrived as refugees to the emperor of the Romaioi Heraclius before the Serbs came as refugees to the same Emperor Heraclius, at that time when the Avars had fought and expelled from those parts the Romani... Now, by the command of the Emperor Heraclius, these same Croats fought and expelled the Avars from those parts, and, by mandate of Heraclius the emperor they settled down in that same country of the Avars, where they now dwell. These same Croats had the father of Porga for their archon at that time... (It should be known) that ancient Croatia, also called "white", is still unbaptized to this day, as are also its neighboring Serbs. They muster fewer horsemen as well as fewer foot than baptized Croatia, because they are constantly plundered by the Franks and Turks and Pechenegs. Nor do they have either sagēnai or kondourai or merchant ships, because they live far away from sea; it takes 30 days of travel from the place where they live to the sea. The sea to which they come down to after 30 days, is that which is called dark". According to this chapter, the Pechenegs and Hungarians were neighbours of the White Croats to the east in the second half of the 9th century. In that time Franks plundered Moravia, and White Croatia was probably a part of the Great Moravia. A similar story to the 30th chapter is mentioned in the work by Thomas the Archdeacon, Historia Salonitana (13th century), where he recounts how seven or eight tribes of nobles, which he called Lingones, arrived from present-day Poland and settled in Croatia under Totila's leadership. According to the Archdeacon, they were called Goths, but also Slavs, depending on the personal names of those who came from Poland or the Czech lands. Some scholars consider Lingones to be a distortion of the name for the Polish tribe of Lendians. Alfred the Great in his Geography of Europe (888–893) relying on Orosius, recorded that, "To the north-east of the Moravians are the Dalamensae; east of the Dalamensians are the Horithi (Choroti, Choriti; Croats), and north of the Dalamensians are the Servians (Serbs); to the west also are the Silesians. To the north of the Horiti is Mazovia, and north of Mazovia are the Sarmatians, as far as the Riphean Mountains". The initial north-east position was probably wrongly transcribed, as a north-west position agrees with other sources on the location of the Croats on the Oder and Vistula Rivers. Nestor described how many East Slavic tribes of "...the Polyanians, the Derevlians, the Severians, the Radimichians, and the Croats lived at peace". In 904-907, "Leaving Igor (914–945) in Kiev, Oleg (879–912) attacked the Greeks. He took with him a multitude of Varangians, Slavs, Chuds, Krivichians, Merians, Polyanians, Severians, Derevlians, Radimichians, Croats, Dulebians, and Tivercians, who are pagans. All these tribes are known as Great Scythia by the Greeks. With this entire force, Oleg sallied forth by horse and by ship, and the number of his vessels was two thousand". The list indicates that the closest tribal neighbours were Tivertsti and Dulebes-Volhynians. After Vladimir the Great (980–1015) conquered several Slavic tribes and cities to the West, in 992 he "attacked the Croats. When he had returned from the Croatian War, the Pechenegs arrived on the opposite side of the Dnieper". Since then those Croats became part of Kievan Rus, and aren't mentioned anymore in Russian Chronicles. It seems that Croatian tribes who lived in the area of Bukovina and Galicia were conquered because inhibited Kievan Rus free access to the Vistula river, did not want to submit to Kievan centralism and accept Christianity. After the attack, since 1124 the territory became part of Principality of Halych. Polish chronicler Wincenty Kadłubek in his Chronica Polonorum (12-13th century) recounted that Bolesław I the Brave (992 to 1025) conquered some "Hunnos seu Hungaros, Cravatios et Mardos, gentem validam, suo mancipavit imperio". The occurrence of the Croatian name among the toponyms, indicates that the Croatia near the Vistula river corresponded with the later territory of Lesser Poland. Many Croats also lived in the territory of Bohemia. The Prague Charter from 1086 AD (actually with data from 973) mentions that on the northeastern frontier of the Prague diocese lived "Psouane, Chrouati et altera Chrowati, Zlasane...". They were also probably settled east of Zlicans and west of Moravians having significant territory around the Elbe river, while the others were present along the upper Vistula in Poland. Some scholars located these Czech Croats within the territory of present-day Chrudim, Hradec Králové, Libice and Kłodzko. Vach argued that they had the most developed techniques of building fortifications among the Czech Slavs. Many scholars consider that the Slavník dynasty, which competed with the Přemyslid dynasty for control over Bohemia (and eventually succumbed to them) and partly controlled Croats territory, was of White Croat origin. According to a legend about Wenceslaus I, his mother Drahomíra fled in exile to Xorvaty. After the Slavník dynasty's main Gord (fortified settlement) Libice was destroyed in 995, the White Croats aren't mentioned anymore in that territory. Thietmar of Merseburg recorded in 981 toponym Chrvuati vicus (also later recorded in 11th-14th century), which is present-day Großkorbetha, between Halle and Merseburg in Saxony-Anhalt, Germany. The Chruuati (901) and Chruuati (981) near Halle. In charter by Henry II is recorded Chruazzis (1012), by Henry III as Churbate (1055), by Henry IV as Grawat (also Curewate, 1086). This settlement today is Korbetha on river Saale, near Weißenfels. In the 10th-12th centuries Croatian name can be often found in the territory of March and Duchy of Carinthia, as well March and Duchy of Styria. In 954, Otto I in his charter mentions župa Croat - "hobas duas proorietatis nostrae in loco Zuric as in pago Crouuati et in ministerio Hartuuigi", and again in 961 pago Crauuati. The pago Chruuat is also mentioned by Otto II (979), and pago Croudi by Otto III. In the 10th century, Arab historian Al-Masudi in his work The Meadows of Gold mentioned Harwātin or Khurwātīn, between Moravians, Chezchs and Saxons. In the geography book Hudud al-'Alam in the area of Slavs is mentioned their two capital cities, Wabnit (actually Wāntit, considered Antes), the first city East of Slavs, and Hurdāb, a big city where rulers reside on river Rūtā (probably Prut). In the chronicles of the time word šahr meant "country, state, city" - thus Hurdāb represented Croats. In work by Abu Saʿīd Gardēzī it is mentioned as ʒ(h)-rāwat. Ahmad ibn Rustah recounts that the land of Pechenegs is ten days away from the Slavs, and that the city in which lives Swntblk (Svatopluk) is called ʒ-r-wāb (Džervab > Hrwat), where every month Slavs do three-day long trade fair. Swntblk is called "king of kings", has riding horses, sturdy armor, eats mare's milk, and is more important than Subanj (considered Slavic title župan), who is his deputy. George Vernadsky considered these details as evidence of Alanic and Eurasian nomadic origin of the ruling caste among those Slavs. In the Hebrew book Josippon are listed four Slavic ethnic names from Venice to Saxony; Mwr.wh (Moravians), Krw.tj (Croats), Swrbjn (Sorbs), Lwcnj. Those Croats are probably those who were located in Bohemia. White Croats seemingly were not recorded by the Bavarian Geographer, however, some scholars assumed that the unknown Sittici ("a region with many peoples and heavily fortified cities") and Stadici ("an infinite population with 516 gords") were part of the Carpathian Croats tribal polity, or the Croats were part of this unknown tribal designation in Prykarpattia. Others in unknown Lupiglaa (with 30 gords) saw Czech Croats and Zlicans. It is considered that the Czech-Polish Croatian tribes were related to the Croatian tribes from Zakarpattia and Prykarpattia in Ukraine. They became separated during the migration period and seemingly formed one large Proto-Slavic tribe. It is theorized that the migration of those (White) Croatian tribes in the 7th century was the second and final Slavic migratory wave to the Balkans, which is related to the thesis by Bogo Grafenauer about the double migration of Slavs. According to this thesis, although it is possible that some Croatian tribes were present among Slavs in the first Slavic-Avar wave in the 6th century, it is argued that the Croatian migration in the second wave probably was not equally numerous to make a significant common-linguistical influence, while others considered they arrived in a significantly larger number. Zdenko Vinski and V. V. Sedov argued that the double migration thesis is supported by the rare findings of objects and ceramics of Prague-Korchak culture on the territory of Croatia, Bosnia and Herzegovina, and Serbia which were dated to the end of 6th and beginning of the 7th century (indicating first wave Slavs), and did not make a continuity with Slavic archaeological findings from the 8th-9th century, indicating assimilation. The Croatian tribes are also seen as a warrior group who assimilated into already present Slavs. In the territory of present-day Croatia they also gradually assimilated with the Pre-Slavic population because archaeology indicates a significant continuity of late antiquity population which have partially withdrawn to the mountains, coastal cities and islands. By the 7th century White Croats had established and fortified Horods (Gord), which became a commerce and trade centers. Galicia was an important geographical location because it connected via an overland route Kiev in the East with Krakow, Buda, Prague and other cities in the West, as well as northwest to the Baltic Sea and southeast to the Black Sea. Along these routes were founded the settlements of Przemyśl, Zvenyhorod, Terebovlia, Halych, and Uzhhorod, of which the last was ruled by a mythical ruler Laborec. According to research by Sedov in 1979, all early mentions of Croatian ethnonym are in the areas where ceramics of Prague-Penkovka culture were found. It originated in the area between Dniester and Dnieper, and later expanded to the West, and its bearers were the Antes tribes. A. V. Majorov criticized Sedov's consideration, which almost exclusively related White Croats with Penkovka culture and the Antes, because the territory White Croats inhabited in the middle and upper Dniester and the upper Vistula was part of Prague-Korchak culture related to Sclaveni which was characteristic for the Kurgan-type of burial which was also found in the upper Elbe territory where lived the Czech Croats. They were representatives of both these archaeological cultures and possibly formed before them at the least late 4th or during the 5th century in the area of the intertwining of these cultures around the Dniester basin. The Carpathian Croats later were part of the Luka-Raikovets culture. Mound of the gord Stilsko. Archaeological excavations held between 1981-1995 by Ukrainian archaeologist and historian Orest Korčinski and others who researched Early Middle Age Gords in Prykarpattia and Western Podolia dated between 9th-11th century found that fortified Gords with a range of 0.2 ha made 65%, those of 2 ha 20%, and more than 2 ha 15% in that region. There were 35 Gords, including big Gords like Revno, Stilsko, Zhydachiv, Kotorin complex, Klyuchi, Stuponica, Krylos, Pidhorodyshche, Terebovlia, Ganachivka, Solonsko among others. Only 12 of them survived until the 14th century. Korčinski's excavation revealed a Gord (since 2008 dated in between 8th-9th century) of unusually big dimension with a surface of 250 ha, including a fortress of 15 ha, defensive line of 10 km, located on river Kolodnitsa (connected to most important river in the region, Dniester) between current village Stilsko and Lviv which Ukrainian archaeologists attribute to the White Croats. In its vicinity were also found some of the only examples of a pre-Christian period cult building among Slavs, for one of which Korčinski assumed a possible connection with the medieval descriptions of a temple dedicated to the deity Hors. Until 2008 near Stilsko have been found more than 50 settlements of open type dated between 8th-10th century, as well around 200 burial mounds. It indicates a high economic, demographic, defense and political organization, and is argued to have been a capital of Eastern (Carpathian) Croats. According to archaeological material, by the end of 10th and beginning of 11th century it ceased to exist for now unknown reasons and the fire traces of possible enemy invasion are not considered as sufficient consequence. Excavations of many Slavic Kurgans and tombs in the Carpathian Mountains in the 1930s and 1960s were also attributed to the White Croats. Compared to other East Slavic tribes, the area of the Croats stands out because of very present tiled tombs, and in the 11th and 13th century their appearance in Western Dnieper region is attributed to the Croats, and sometimes Tivertsi. Scholars attribute to the Croats also the forts West and North of river Prut and in Northern Bukovina; the Revno, Červona Dibrova, Kodin, Bila, Široka Poljana, Klokučka, Grobnica, Červenovo, Orosijevo, Červone, Ungvár. In the territory of Czech Republic, a significant number of graves with kurgans dated 8th-10th century have been found around the Elbe river where was the presumed territory by the White Croats and Zlicans, as well among Dulebes in the South, and Moravians in the East. Croatian tribes were like other Slavs polytheists - pagans. Their worldview intertwined with worship of power and war, to which raised places of worship, and demolished those of others. These worships were in contrast to Christianity, and conflict when Christianism became official ideology among the Slavs. The White Croats at the earliest historical sources are mentioned as pagans, and they were similar to the inhabitants of Kievan Rus' who also received Christianity late (988). Slavs often related places of worship with the natural environment, like hills, forests, and water. Some argue that Przemyśl was their as well as Slavic bishops capital in the 9th-century because there were uncovered foundations of a round chapel and palace made of cut stone. According to Nestor, Vladimir the Great in 980 raised on a hill near his fort pantheon of Slavic gods; Perun, Hors, Dažbog, Stribog, Simargl, and Mokosh, but as he converted to Christianity in 988 one of the probable reasons Vladimir attacked Croats in 992 was because they didn't want to abandon their old beliefs and accept Christianity. Some scholars derived Croatian ethnonym from the Iranian word for Sun - hvar. Paščenko argued possibility that in the ethnonym of the Croats could be seen archaic religion and mythology - the worship of the Slavic solar deity Hors (Sun, heavenly fire, force, war), which is of Iranian origin. The legend about five brothers and two sisters recorded in Constantine VII's work De Administrando Imperio was probably part of an oral tradition, which contradicts the role of Heraclius in the arrival of Croats to Dalmatia. It is similar to other medieval origo gentis stories (see for e.g. Origo Gentis Langobardorum), and some consider it has the same source as the story of Bulgars recorded by Theophanes the Confessor in which the Bulgars subjugated Seven Slavic tribes, and similarly, Thomas the Archdeacon in his work Historia Salonitana mentions that seven or eight tribes of nobles, which he called "Lingones", arrived from present-day Poland and settled in Croatia under Totila's leadership. In this legend is also possibly reflected a migration of seven tribes. Curiously, Croats are seemingly the only Slavic people who had a saga about the period of their migration. Also, compared to other medieval stories none of them mentions female personalities, which could indicate a different social organization or different tribes who joined the Croats. For example, Henryk Łowmiański considered the Mazovians, Dulebes, Croats and Veleti among the oldest Slavic tribes because Mazovians ethnonym was often related to Amazons (-maz-) while the land of women in North Europe was mentioned by Paul the Deacon, Alfred the Great, as well women's city West of Russian lands by Ibrahim ibn Yaqub. Another vagueness is a reason and meaning that one of the brothers had a Croatian ethnonym as a name, perhaps indicating he was more important than the other brothers or that the Croats were only one identity among others with which the Adriatic Croats tried to bring legitimacy to the Croatian Kingdom. The origin of the names of five brothers and two sisters are a matter of dispute. They are often considered to be of non-Slavic origin, and genuine names, as the anonymous Slavic narrator (probably a Croat) couldn't invent the non-Slavic names of their ancestors in the 9th century. J.J. Mikkola considered them to be of Turkic origin, Vladimir Košćak of possible Iranian-Alanic origin, while Alemko Gluhak saw parallels in Slavic Old Prussian and Baltic languages. Henri Grégoire rejected Turkic origin, and related them to Slavic place names which previously were part of White Croatia, while Josip Modestin connected their names to toponyms from Lika, where early Croats settled. According to Gluhak, names Kloukas, Lobelos, Kosentzes and possibly Mouchlo don't seem to be part of Scythian or Alanic name directory. Kloukas; has Greek suffix "-as", thus the root Klouk- has several derivations; Mikkola considered Turkic Külük, while Tadeusz Lewicki Slavic Kuluk and Kluka. Grégoire related it with cities Cracow or Głogów. Modestin related it to village Kukljić. Vjekoslav Klaić and Vladimir Mažuranić related to the Kukar family, one of the Twelve noble tribes of Croatia. Mažuranić additionally related to contemporary surnames Kukas, Kljukaš, Kljuk. Gluhak noted several Prussian and Latvian personal names and toponyms with root *klauk-, which relates to sound-writing verbs *klukati (peck) and *klokotati (gurgle). The first mentioned king of the Alans was named Kuluk (c. 51-78 AD). Lobelos; Mikkola considered it a name of uncertain Avar ruler. Grégoire related it with city Lublin. Modestin related it to Lovinac. Rački considered Ljub, Lub, Luben, while Mažuranić noted similar contemporary surnames like Lubel. Osman Karatay considered common Slavic shift Lobel < Alpel (as in Lab < Elbe). Gluhak noted many Baltic personal names with root *lab- and *lob- e.g. Labelle, Labulis, Labal, Lobal, which derive from *lab- (good) or lobas (bays, ravine, valley). Kosentzis; Mikkola considered Turkic suffix "-či", and derived it from Turkic koš (camp), košun (army). Grégoire related it with city Košice. Modestin related it to Kosinj. Mažuranić considered it similar to contemporary male names Kosan, Kosanac, Kosančić and Kosinec. Many scholars consider relation with Old-Slavic title word *kosez or *kasez, that meant social class members who freely elected the knez of Carantania (658–828). In the 9th century they became nobles, and their tradition preserved until the 16th century. There were many toponyms with the title in Slovenia, but also in Lika in Croatia. Gluhak also noted Baltic names with root *kas- which probably derives from kàsti (dig), and Thracian Kossintes, Cosintos, Cositon. Mouchlo; Mikkola related it to the name of 6th century Hunnic (Bulgar or Kutrigur) ruler Mougel/Mouâgeris. Modestin related it to Mohl(j)ić. Mažuranić considered tribe and toponym Mohlić also known as Moglić or Maglić in former Bužani župa, as well medieval toponym or name Mucla, contemporary surnames Muhoić, Muglič, Muhvić, and Macedonian village Mogila (Turk. Muhla). Emil Petrichevich-Horváth related it to the Mogorović family, one of the Croatian "twelve noble tribes". Gluhak noted Lithuanian muklus and Latvian muka which refer to the mud and marshes, and Prussian names e.g. Mokil, Mokyne. There existed Antes king Musokios/Musocius. Chrobatos; read as Hrovatos, is generally considered to represent Croatian ethnonym Hrvat/Horvat, and the Croatian tribe. Some scholars like J. B. Bury related it with the Turkic name of the Bulgars khan Kubrat. This etymology is problematic, beside from historical viewpont, as in all forms of Kubrat's name, the letter "r" is third consonant. Touga; Mikkola related it with male Turkic name Tugai. Modestin and Klaić related it to the Tugomirić family, one of the Croatian "twelve noble tribes", as well Klaić noted that in 852 was a settlement Tugari in the Kingdom of Croatia which people in Latin sources were called as Tugarani and Tugarini, while Mažuranić noted certain Tugina and župan Tugomir. Gluhak noted Old Norse-Germanic *touga (fog, darkness), which meaning wouldn't be much different from other names with Baltic derivation. Bouga; Mikkola related it with male Turkic name Buga, while Lewicki noted Turkic name of Hun Bokhas, Peceneg Bogas, and two generals of Arabian kalifs, Bogaj. Grégoire related it with the Bug River. Modestin and Klaić related it to East-Slavic medieval tribe Buzhans who lived on Bug River, as well medieval Croatian tribe Bužani and its župa Bužani or Bužane. Gluhak noted Proto-Slavic word *buga which in Slavic languages mean "swamp" like places, and the river Bug itself derives from. Porga from 31st chapter according to Živković derives from Iranian pouru-gâo, "rich in cattle". However, in the 30th chapter, it is named Porin, and recently Milošević, Alimov, and Budak supported a thesis which considered these names as two variants of the Slavic deity Perun, as a heavenly ruler and not an actual secular ruler. Polish writer Kazimierz Władysław Wóycicki released work Pieśni ludu Białochrobatów, Mazurów i Rusi z nad Bugu in 1836. In 1861, in the statistical data about population in Volhynia governorship released by Mikhail Lebedkin, were counted Horvati with 17,228 people. According to some American documents from the beginning of the 20th century, Polish immigrants to the US born in around Kraków declared themselves as Krakus, Crakowiak, or Bielochrovat (i.e. White Croat) by nationality. The White Croats contributed and assimilated into Czech, Polish and Ukrainian ethnos. Some scholars consider White Croats as the predecessors of the Rusyn people, particularly Lemkos. According to Czech and Polish chronicles, the legendary Lech and Czech came from (White) Croatia. The Chronicle of Dalimil (14th century) recounts "V srbském jazyku jest země, jiežto Charvaty jest imě; v téj zemi bieše Lech, jemužto jmě bieše Čech". Alois Jirásek recounted as "Za Tatrami, v rovinách při řece Visle rozkládala se od nepaměti charvátská země, část prvotní veliké vlasti slovanské" (Behind the Tatra Mountains, in the plains of the river Vistula, stretched from immemorial time Charvátská country (White Croatia), the initial part of the great Slavic homeland), and V té charvátské zemi bytovala četná plemena, příbuzná jazykem, mravy, způsobem života (In Charvátská existed numerous tribes, related by language, manners, and way of life). Dušan Třeštík noted that the chronicle tells Czech came with six brothers from Croatia which once again indicates seven chiefs/tribes like in the Croatian origo gentis legend from the 30th chapter of De Administrando Imperio. It is considered that the chronicle refers to the Carpathian Croatia. One of the legendary figures Kyi, Shchek and Khoryv who founded Kiev, brother Khoryv or Horiv, and its oronym Khorevytsia, is often related to the Croatian ethnonym. This legend, recorded by Nestor, has similar Armenian transcript from the 7th-8th century, in which Horiv is mentioned as Horean. Paščenko related his name, beside to the Croatian ethnonym, to solar deity Hors. Near Kiev there's a stream where previously existed large homonymous village Horvatka or Hrovatka (destroyed in the time of Joseph Stalin), which flows into Stuhna River. In the vicinity are parts of the Serpent's Wall. ealdne eþelstol Ætlan leodum. their ancestral seat against Attila's host. The Hræda is genitive plural of *Hraede, and is usually related with the Goths (Hred-Gotum, Hreth-Gotan, Hreidhgotar). However, this verse is similar to the one in Hervarar saga ok Heiðreks (13th century), where prior the battle between Goths and Huns, Heidrek died in Harvaða fjöllum (Carpathian Mountains) which is sometimes translated as "beneath the mountains of Harvathi", considered somewhere beneath Carpathian Mountains near river Dnieper. Lewicki argued that Anglo-Saxons, as in the case of Alfred the Great where called Croats Horithi, often distorted foreign Slavic names. The legendary Czech hermit from the 9th century, Svatý Ivan, is mentioned as the son of certain king Gestimul or Gostimysl, who according to the Czech chronicles descended from the Croats or Obotrites. ^ Subtelny 2009, p. 57. ^ Magocsi 2010, p. 49. ^ a b Dzino 2010, pp. 113, 21. ^ a b Paščenko 2006, p. 131. ^ a b Magocsi 1995. ^ a b c Magocsi 2005, p. 5. ^ a b Majorov 2012, p. 78. ^ Gluhak 1990, p. 95. ^ Sedov 2013, p. 115, 168, 444. ^ Heršak, Nikšić 2007, p. 262. ^ Gluhak 1990, p. 100–101. ^ Gluhak 1990, p. 101–102. ^ Gluhak 1990, p. 102. ^ Paščenko 2006, p. 42–54. ^ Sedov 2013, p. 115, 168. ^ Gluhak 1990, p. 110. ^ Paščenko 2006, p. 84. ^ Gluhak 1990, p. 115–116. ^ Paščenko 2006, p. 84–87. ^ Sedov 2013, p. 444, 451, 501, 516. ^ Košćak 1995, p. 111. ^ a b Paščenko 2006, p. 141. ^ a b Sedov 2013, p. 168, 444, 451. ^ Heršak, Nikšić 2007, p. 263. ^ Živković 2012, p. 84–88. ^ Gluhak 1990, p. 122–125. ^ Paščenko 2006, p. 27. ^ Kim 2013, pp. 146, 262. ^ Magocsi 1983, p. 49. ^ a b c d e f Magocsi 2002, p. 4. ^ a b c d e Van Antwerp Fine, Jr. 1991, pp. 53, 56. ^ Majorov 2012, p. 58. ^ Paščenko 2006, p. 115–116. ^ a b c Korčinskij 2006, p. 37. ^ Majorov 2012, p. 87–89. ^ Gluhak 1990, p. 305–306. ^ Škegro 2005, p. 12. ^ Norris 1993, p. 15. ^ Marčinko 2000, p. 318–319, 433. ^ a b Gluhak 1990, p. 127. ^ a b c Danylenko 2004, pp. 1–32. ^ Škegro 2005, p. 13. ^ Paščenko 2006, p. 88, 91–92. ^ Paščenko 2006, p. 87–95. ^ Cross, Sherbowitz-Wetzor 1953, p. 53. ^ Gluhak 1990, p. 116–117. ^ Živković 2012, p. 111–122. ^ a b Gluhak 1990, p. 217. ^ a b c d Majorov 2012, p. 62. ^ Sedov 2013, p. 182. ^ Živković 2012, p. 120. ^ Živković 2012, p. 49, 54, 83, 88. ^ Živković 2012, p. 89. ^ a b c Heršak, Nikšić 2007, p. 259. ^ Gluhak 1990, p. 129–130. ^ Gluhak 1990, p. 130. ^ Majorov 2012, p. 52. ^ Ingram 1807, p. 72. ^ Gluhak 1990, p. 210. ^ Cross, Sherbowitz-Wetzor 1953, p. 56. ^ Cross, Sherbowitz-Wetzor 1953, p. 64. ^ Majorov 2012, p. 69. ^ Cross, Sherbowitz-Wetzor 1953, p. 119. ^ a b Gluhak 1990, p. 144. ^ Hanak 2013, p. 32. ^ a b c Paščenko 2006, p. 123. ^ Korčinskij 2000, p. 113. ^ Korčinskij 2006, p. 39. ^ Majorov 2012, p. 74. ^ Gluhak 1990, p. 147. ^ Gluhak 1990, p. 148. ^ Sedov 2013, p. 428. ^ Gluhak 1990, p. 149. ^ Vach & 2006 (1949), p. 239. ^ Widajewicz & 2006 (1949), p. 267–268. ^ Vach & 2006 (1949), p. 240–242. ^ Sedov 2013, p. 431. ^ Gluhak 1990, p. 150. ^ Vach & 2006 (1949), p. 255–256. ^ a b c Gluhak 1990, p. 151. ^ a b Gluhak 1990, p. 158. ^ Marčinko 2000, p. 183. ^ Gluhak 1990, p. 161–167. ^ Gluhak 1990, p. 161. ^ Gluhak 1990, p. 161–162. ^ Gluhak 1990, p. 162. ^ Gluhak 1990, p. 211. ^ a b Zimonyi 2015, pp. 295, 319. ^ a b Gluhak 1990, p. 212–213. ^ Gluhak 1990, p. 211–212. ^ Majorov 2012, p. 161. ^ a b Gluhak 1990, p. 212. ^ Korčinskij 2006, p. 32. ^ a b Vernadsky & 2008 (1935), p. 262–263. ^ a b Gluhak 1990, p. 214. ^ Koncha 2012, p. 17. ^ Kugutjak 2017, p. 26. ^ Tomenčuk 2017, p. 32. ^ Łowmiański & 2013 (1958), p. 120. ^ Budak 2018, p. 93. ^ Sedov 2013, p. 168, 444, 451, 501, 516. ^ a b c Budak 2018, pp. 97. ^ Sedov 2013, p. 176, 446, 460. ^ Sedov 2013, p. 169, 175–176, 444, 460. ^ Budak 2018, pp. 104–105. ^ Sedov 2013, p. 446. ^ Gluhak 1990, p. 130–134. ^ Majorov 2012, p. 85, 131, 168. ^ Majorov 2012, p. 85–86, 168. ^ Cvijanović, Irena (2013). "The Typology of Early Medieval Settlements in Bohemia, Poland and Russia". In Rudić, Srđan (ed.). The World of the Slavs: Studies of the East, West and South Slavs: Civitas, Oppidas, Villas and Archeological Evidence (7th to 11th Centuries AD). Istorijski institut. pp. 289–344. ISBN 978-86-7743-104-4. ^ Korčinskij 2006, p. 34–35. ^ Korčinskij 2000, p. 113–120. ^ Korčinskij 2006, p. 38–39. ^ Korčinskij 2000, p. 120. ^ Korčinskij & 2013 (2008), p. 210–212. ^ Korčinskij 2004, p. 2. ^ a b c Korčinskij & 2013 (2008), p. 212. ^ Korčinskij & 2006 (1991), p. 68–71. ^ Korčinskij 2004, p. 2–7. ^ Korčinskij & 2013 (2008), p. 220–221. ^ Korčinskij & 2006 (1991), p. 71. ^ Korčinskij & 2013 (2008), p. 221. ^ Korčinskij & 2006 (1991), p. 70. ^ Korčinskij & 2013 (2007), p. 264. ^ Paščenko 2006, p. 113. ^ Sedov 2013, p. 502. ^ Paščenko 2006, p. 118. ^ Paščenko 2006, p. 119. ^ Sedov 2013, p. 430, 435–437. ^ Paščenko 2006, p. 143. ^ Paščenko 2006, p. 144, 146. ^ Paščenko 2006, p. 144. ^ Paščenko 2006, p. 145, 147. ^ Paščenko 2006, p. 145. ^ Struk 1993, p. 841. ^ Paščenko 2006, p. 59. ^ Majorov 2012, p. 92. ^ Paščenko 2006, p. 79. ^ Paščenko 2006, p. 67–82, 109–111. ^ a b Budak 2018, pp. 95. ^ Budak 2018, pp. 89. ^ a b Alimov 2015, pp. 153. ^ a b Gluhak 1990, p. 222. ^ Alimov 2015, pp. 142. ^ Sedov 2013, p. 481. ^ Živković 2012, p. 114. ^ a b Gluhak 1990, p. 126–127. ^ Margetić 2001, p. 32. ^ Gluhak 1990, p. 126, 218. ^ Gluhak 1990, p. 218–221. ^ a b c d e Karatay 2003, p. 93. ^ a b c d e f g Gluhak 2000, p. 21. ^ a b Gluhak 1990, p. 218. ^ a b c d e Gluhak 1990, p. 126. ^ Mažuranić 1908–1922, p. 408. ^ Mažuranić 1908–1922, p. 408, 555. ^ Mažuranić 1908–1922, p. 408, 607. ^ a b Karatay 2003, p. 92. ^ Gluhak 1990, p. 219. ^ Mažuranić 1908–1922, p. 408, 528. ^ Gluhak 1990, p. 128–129. ^ Golden 1990, p. 99. ^ Mažuranić 1908–1922, p. 408, 528, 677, 688. ^ Gluhak 1990, p. 220. ^ a b Karatay 2003, p. 86–91. ^ Mažuranić 1908–1922, p. 408, 1473. ^ a b Gluhak 1990, p. 221. ^ Živković 2012, p. 54. ^ Alimov 2015, pp. 141–164. ^ Budak 2018, pp. 95–96. ^ Gluhak 1990, p. 121–122. ^ Gluhak 1990, p. 145. ^ United States Immigration commission 1911, pp. 22, 40, 43, 88, 105. ^ Magocsi 2015, p. 29. ^ Katchanovski, Ivan; Kohut, Zenon E.; Nebesio, Bohdan Y.; Yurkevich, Myroslav (2013). Historical Dictionary of Ukraine. Scarecrow Press. p. 321. ISBN 978-0-8108-7847-1. In the opinion of some scholars, the ancestors of the Lemkos were the White Croatians, who settled the Carpathian region between the seventh and tenth centuries. ^ Sedov 2012, p. 15. ^ Malyckij & 2006 (1990), p. 106–107. ^ a b Paščenko 2006, p. 99–102, 109. ^ Malyckij & 2006 (1990), p. 107. ^ Strižak & 2006 (1990), p. 106–107. ^ Strižak & 2006 (1990), p. 187. ^ a b Lewicki & 2006 (1951), p. 95. ^ Pendergrass 2015, p. 75. ^ Shippey 2014, p. 53. ^ Acker & Larrington 2013, p. 245. ^ Budak 2018, pp. 96. ^ Lewicki & 2006 (1951), p. 95–96. ^ Vašica & 2008 (1935), p. 242, 244, 247–248, 250–258. Acker, Paul; Larrington, Carolyne (2013). Revisiting the Poetic Edda: Essays on Old Norse Heroic Legend. Routledge. ISBN 9781136227875. Denis Jevgenjevič Alimov (2015). "Hrvati, kult Peruna i slavenski gentilizam (Komentari na hipotezu Ante Miloševića o identitetu Porina i Peruna)" [Croats, the cult of Perun and Slavic “gentilism”. (A Comment on the hypothesis of Ante Miloševic about the identity of Porin and Perun)]. Starohrvatska prosvjeta. III (42): 141–164. Budak, Neven (2018). Hrvatska povijest od 550. do 1100 [Croatian history from 550 until 1100]. Leykam international. pp. 86–118. ISBN 978-953-340-061-7. Danylenko, Andrii (2004). "The name Rus': In search of a new dimension". Jahrbücher für Geschichte Osteuropas (52): 1–32. And the tribe which lives near them [the Amazons] is the Harus [Hrus/Hros], tall, big-limbed men, who have no weapons of war, and horses cannot carry them because of the bigness of their limbs. Dzino, Danijel (2010). Becoming Slav, Becoming Croat: Identity Transformations in Post-Roman and Early Medieval Dalmatia. BRILL. ISBN 9789004186460. Van Antwerp Fine, Jr., John (1991). The Early Medieval Balkans: A Critical Survey from the Sixth to the Late Twelfth Century. University of Michigan Press. ISBN 9780472081493. Hanak, Walter K. (2013). The Nature and the Image of Princely Power in Kievan Rus’, 980-1054: A Study of Sources. BRILL. ISBN 9789004260221. Ingram, James (1807). An Inaugural Lecture on the Utility of Anglo-Saxon Literatures to which is Added the Geography of Europe by King Alfred, Including His Account of the Discovery of the North Cape in the Ninth Century. University Press. Jirásek, Alois (2015). "4". Staré pověsti české. ISBN 9788088061144. Retrieved 29 August 2015. Koncha, S. (2012). Bavarian Geographer On Slavic Tribes From Ukraine (PDF). Ukrainian Studies. 12. Bulletin of Taras Shevchenko National University of Kyiv. pp. 15–21. Korčinskij, Orest (2006). "Bijeli Hrvati i problem formiranja države u Prikarpatju" [Eastern Croats and the problem of forming the state in Prykarpattia]. In Nosić, Milan (ed.). Bijeli Hrvati I [White Croats I] (in Croatian). Maveda. pp. 31–39. ISBN 953-7029-04-2. Korčinskij, Orest (2006). "Stiljski grad" [City of Stiljsko]. In Nosić, Milan (ed.). Bijeli Hrvati I [White Croats I] (in Croatian). Maveda. pp. 68–71. ISBN 953-7029-04-2. Korčinskij, Orest (2013). "O povijesnoj okolici stiljskoga gradišta od kraja 8. stoljeća do početka 11. st." [City of Stiljsko]. In Nosić, Milan (ed.). Bijeli Hrvati III [White Croats III] (in Croatian). Maveda. pp. 210–224. ISBN 978-953-7029-27-2. Korčinskij, Orest (2013). "Stiljsko gradište" [Gord of Stilsko]. In Nosić, Milan (ed.). Bijeli Hrvati III [White Croats III] (in Croatian). Maveda. pp. 246–26. ISBN 978-953-7029-27-2. Kugutjak, Mykola (2017). "Spomenici povijesti i kulture: Gradišta Pruto-Bystryc'koga podgorja". In Paščenko, Jevgenij; Fuderer, Tetyana (eds.). Prikarpatska Galicija (PDF) (in Croatian). Department of Ukrainian Language and Literature at the Faculty of Philosophy, University of Zagreb. pp. 20–31. ISBN 978-953-55390-4-9. Łowmiański, Henryk (2013). "O identificiranju naziva Bavarskoga geografa" [About the identification of names by Bavarian Geographer]. In Nosić, Milan (ed.). Bijeli Hrvati III [White Croats III] (in Croatian). Maveda. pp. 109–137. ISBN 978-953-7029-27-2. Magocsi, Paul Robert (1983). Galicia: A Historical Survey and Bibliographic Guide. University of Toronto Press. ISBN 9780802024824. Magocsi, Paul Robert (1995). "The Carpatho-Rusyns". Carpatho-Rusyn American. Carpatho-Rusyn Research Center. XVIII (4). Magocsi, Paul Robert (2002). The Roots of Ukrainian Nationalism: Galicia as Ukraine's Piedmont. University of Toronto Press. ISBN 9780802047380. Magocsi, Paul R. (30 July 2005). Our people: Carpatho-Rusyns and their descendants in North America. Bolchazy-Carducci Publishers. p. 5. ISBN 9780865166110. Magocsi, Paul Robert (2010). 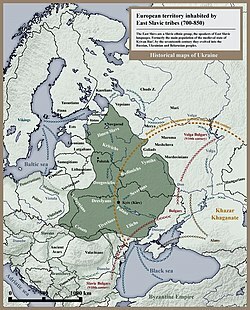 A History of Ukraine: The Land and Its Peoples. University of Toronto Press. ISBN 9781442610217. Malyckij, Oleksandr (2006). "Hrvati u uvodnom nedatiranom dijelu Nestorove kronike "Povijest minulih ljeta"" [Croats in the introductory non-dated part of the Nestor's chronicle "History of the past years"]. In Nosić, Milan (ed.). Bijeli Hrvati I [White Croats I] (in Croatian). Maveda. ISBN 953-7029-04-2. Margetić, Lujo (2001). Dolazak Hrvata [Arrival of the Croats]. Split: Književni krug Split. ISBN 9531631697. Mažuranić, Vladimir (1908–1922). Prinosi za hrvatski pravno-povijesni rječnik [Contributions to the Croatian legal-historical dictionary]. JAZU. Norris, H. T. (1993). Islam in the Balkans: Religion and Society Between Europe and the Arab World. Univ of South Carolina Press. ISBN 9780872499775. Pendergrass, Rocky (2015). Mythological Swords. Lulu.com. ISBN 9781329242814. Sedov, Valentin Vasilyevich (2012) . Славяне в древности [Sloveni u dalekoj prošlosti (Slavs in the distant past)]. Novi Sad: Akademska knjiga. ISBN 978-86-6263-022-3. Shippey, Tom (2014). The Road to Middle-earth: Revised and Expanded Edition. Houghton Mifflin Harcourt. ISBN 9780547524412. Strižak, Oleksij (2006). "Sorbi, Srbi, Hrvati i Ukrajina" [Sorbs, Serbs, Croats and Ukraine]. In Nosić, Milan (ed.). Bijeli Hrvati I [White Croats I] (in Croatian). Maveda. ISBN 953-7029-04-2. Struk, Danylo Husar (1993). Encyclopedia of Ukraine. University of Toronto Press. Subtelny, Orest (2009). Ukraine: A History. University of Toronto Press. ISBN 9781442697287. Škegro, Ante (2005). "Two Public Inscriptions from the Greek Colony of Tanais at the Mouth of the Don River on the Sea of Azov". Review of Croatian History. 1 (1). Tadeusz, Lewicki (2006). "Najstarije spominjanje Višljana u izvorima" [The earliest mention of the Vistulans in sources]. In Nosić, Milan (ed.). Bijeli Hrvati I [White Croats I] (in Croatian). Maveda. ISBN 953-7029-04-2. Tomenčuk, B. P. (2017). "Doba kneževa (od 9. st. do sredine 14. st.): Davni Ǧalyč". In Paščenko, Jevgenij; Fuderer, Tetyana (eds.). Prikarpatska Galicija (PDF) (in Croatian). Department of Ukrainian Language and Literature at the Faculty of Philosophy, University of Zagreb. pp. 32–37. ISBN 978-953-55390-4-9. Vach, Miloslav (2006). "Češki Hrvati" [Czech Croats]. In Nosić, Milan (ed.). Bijeli Hrvati I [White Croats I] (in Croatian). Maveda. ISBN 953-7029-04-2. Vernadsky, George (2008). "Velika Moravska i Bijela Hrvatska" [Great Moravia and White Croatia]. In Nosić, Milan (ed.). Bijeli Hrvati II [White Croats II] (in Croatian). Maveda. ISBN 978-953-7029-12-8. Vašica, Josef (2008). "Legenda o Svetom Ivanu" [Legend of Saint John]. In Nosić, Milan (ed.). Bijeli Hrvati II [White Croats II] (in Croatian). Maveda. ISBN 978-953-7029-12-8. Widajewicz, Józef Widajewicz (2006). "Velika ili Bijela Hrvatska" [Great or White Croatia]. In Nosić, Milan (ed.). Bijeli Hrvati I [White Croats I] (in Croatian). Maveda. ISBN 953-7029-04-2. Zimonyi, Istvan (2015). Muslim Sources on the Magyars in the Second Half of the 9th Century: The Magyar Chapter of the Jayhānī Tradition. BRILL. ISBN 9789004306110. "U.S. Senate, Reports on the Immigration Commission: Dictionary of races or peoples". Washington D.C.: Making of America. 1911. This page was last edited on 23 April 2019, at 20:44 (UTC).